Hornady – Measuring successful reloading one shot at a time! Now many shooters do not dabble into reloading as it is an additional “expense” or “time consuming event” for people who are entirely satisfied with factory produced ammunition. To those that shoot very infrequently, such as a box of ammunition lasts a year or two, reloading is probably not for you. However, reloading in itself can be a means to save money in ammunition costs, or as a means for producing ammunition that when well matched with a specific firearm will generate outstanding accuracy. Getting into reloading itself requires an expenditure of capital in order to assemble the required components for actually going through the entire reloading process. If you reload, you will of course have heard of Hornady. A provider of many excellent bullets and reloading equipment such as those used by the entire gambit of shooting disciplines and their respective firearms. From muzzle-loading single shot rifles, to the most prolific black rifles, revolvers to self-loaders; from the simplest to the most technically innovative firearms imaginable; Hornady is one of the most widely known by shooters across North America. TPF has been fortunate to be able to previously review Hornady products and this installation adds another notch to the belt. Now reloaders have used balance beam scales with great results in the past and they will continue to do so for the forseeable future. However, the ever-increasing field of technology, specifically compact electronics, has allowed for the development of accurate digital scales. A digital scale allows for a simpler operation and higher measuring rates when compared to that of the delicate and cumbersome balance beam arrangements. However, TPF is not stating that digital scales are superior to the tried and true balance beam, in fact, those at TPF still occasionally check the digital scale readings with old school methods. Speaking about scales, for this write-up, TPF looks at another helpful addition to anyone into reloading; a digital scale by Hornady as part of their ‘Lock ‘N’ Load” series of products. 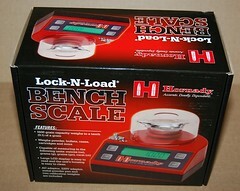 The Bench Scale is the newest digital scale in Hornady’s line and has many features not seen on previous models. Hornady’s ‘Lock-N-Load’ line is well established with many quality products which are dedicated to the reloading audience. With highly visible boxes and a very secure packaging of the product, the electronic scale is nearly assured of arriving damage free to the consumer’s door. Upon the opening of the Bench Scale one can see all the various components which come as standard with the L-N-L Bench Scale. The scale itself has the following characteristics. 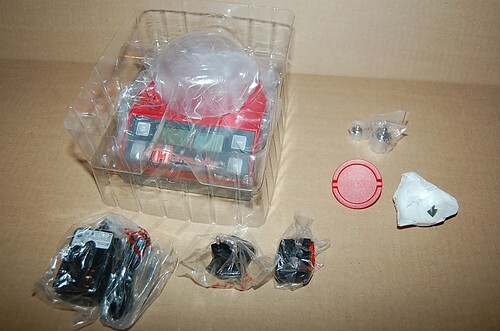 TPF will start the overview with the power supply, which utilizes a universal main body with attachable prong/plug arrangements. 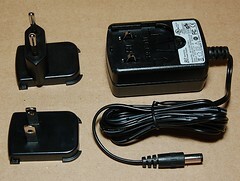 The two configurations included start with the 110V two-blade version for North America, and the 220V two-prong/post version common in Europe. The simple method of converting from one to the other is a bonus, but it is unknown how much of an added bonus this feature is to a consumer. How often does a reloader ship their gear back and forth between North America and Europe? It is a feature which makes it easy for marketing to multiple regions without any changes to the product/SKU/ordering. Observing the metal powder tray, the finish is smooth and will facilitate very clean pouring of powder and a highly visible contrast to observe the volume/amount of powder contained in it. As typical of most forms of scales, the tray is generous in capacity and easy to pick up loaded or empty due to its large “ears”. Also included is the clear acrylic wind guard which is used to prevent errant air currents from influencing the accuracy of the load cell, and it fits securely over a raised ring on the scale which prevents it from being inadvertently dislodged. This is important because the load cell only functions in a single direction, up and down; and any sort of side load will affect the accuracy and the cell is so sensitive that breathing on the measuring base can change the load values. Remember that 0.1 grain accuracy is equivalent to 0.0065 grams (0.0002 oz) and the average stamp masses roughly 0.05 grams (0.001 oz). There is an opening in the top of the guard to allow for powder to be dropped into the tray while the guard is in place. This feature is necessary to most highly sensitive scales; but brings up a possible drawback for some reloaders, in that the overall height of the complete unit would require an elevated powder trickler or other higher mounted powder source to fill the tray for measuring. 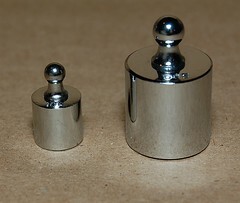 The entire unit is very small in overall space claiming with the mirror finish calibration masses being stored in a pair of integrated pockets on the scale. As the Bench Scale utilizes the same load cell as the Hornady Auto-Charge powder dispenser, and the resulting accuracy is supposedly superb, and as such with all digital scales, the unit should be mounted on a flat, level surface to avoid any side loading on the load cell. Unlike the Auto-Charge however, the scale has a very simple control layout. Only four soft touch buttons are located around the large LCD screen; power ON/OFF, calibration, scale zeroing, and measuring units. The LCD screen has a green backlighting to allow for easy reading of the resultant mass being looked at. With an MSRP of $122.18 USD, this product is available across Canada at various stores which sell Hornady reloading products. One such store is the Gun Centre, located in Kitchener, Ontario. The Lock-N-Load Bench Scale is Hornady’s most recent foray into a standalone digital measuring scales and it is ultimately up to you, the reader to determine if it is tactical, practical, or fantastical. This entry was posted on February 10, 2012 by M. Duynhoven. It was filed under Reloading equipment & supplies and was tagged with bench scale, CSSA, Hornady, Lock-N-Load, Reloading, scale, TPF, TPF-Online. I want to buy an electronic reloading scale that operates on battery and AC. Thinking of the Hornady Lock and Load or the RCBS RangMaster 750. Do you have these and what is the price of each one. If you are looking for a powder dispenser/scale combo, not very many operate on battery anymore. 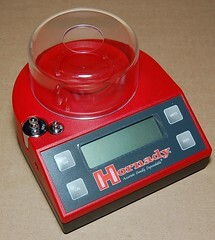 TPF did do a overview of the Hornady Bench Scale, but it is AC powered only. I have used the RCBS for the past 4 years as part of a Chargemaster Combo and I have not had many issues at all. So if you are set on having dual power sources (AC/Battery) then you would most likely be looking at the RCBS 750, or the Lyman 1000/1500 series of scales. Also you may want to compare Pact, Frankford Arsenal, MTM, and Helvetica. Remember that all electronic scales should be on a level surface and that any air currents (including breathing) can effect the scale accuracy/repeatability. The other influencing factor are magnetic fields which can influence the load-cell transducer. If using a battery operated scale, please ensure your batteries are fully charged to ensure accurate readings.